While waiting for a clear weather window to climb Volcano Villarrica we explored some of the local sights around Pucon. In summer Pucon must be heaving with hordes of tourists but on a rainy winters day it is pretty deserted. We dodged the rain and found some cake and empanadas. Both overpriced compared to the rest of Chile but hey this is Pucon; tourist tour capital of Chile! One of the sadder trends of traveling is the rise of the backpacker tour. It is fair enough for locals to earn some cash but it is sad that backpackers don’t explore or seek independent adventure and experiences. When I write this blog a 1000 others pop up where they have all written about the exact same tours they have done in the Pucon area. Visiting in winter is one way to see the area differently, but a bit less planning and a bit more adventure goes a long way to experience novel and more worthwhile experiences. 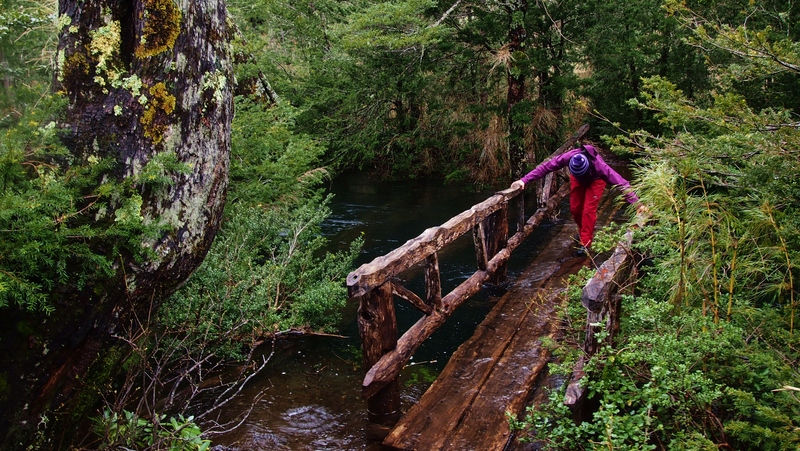 We hiked in Villarrica National Park, Huerquehue National Park and Villarrica National Reserve. In the wet weather the glorious depth of green set against the darken sky made for an unique experience. 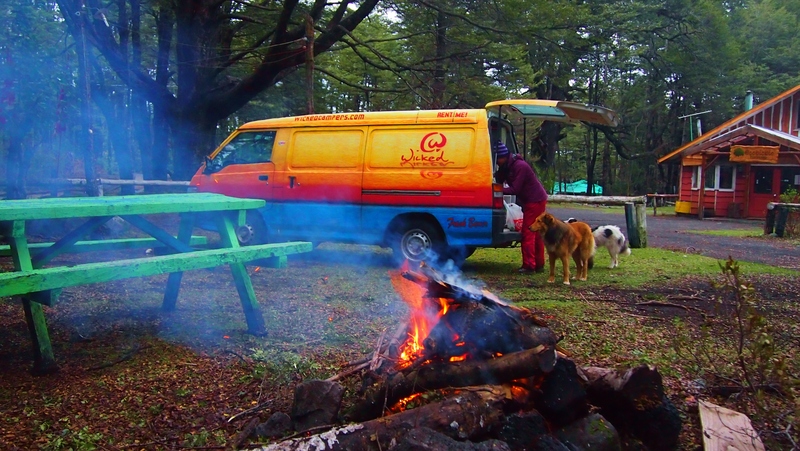 We first visited Huerquehue, we arrived quite late and after a chat with the CONAF ranger we camped next to the entrance arch. He let use use the office facilities, as we sheltered from wind and rain. The trees were bending over double under the strongest gusts, a branch 6 feet above the van was whipping the roof all night, we were convinced a tree would fall near the van! Luckily it didn’t and the next day we cooked breakfast and set off on a hike to the lakes in the park. The large Tinquilco Lake is one of several lakes in the park which we passed on the “Tres Lagos” (Lago Chico, Lago Toro and Laguna Verde) hike. After the recent rain the waterfalls were thunderous, the force of the wind from the falling water was snapping branches off trees! 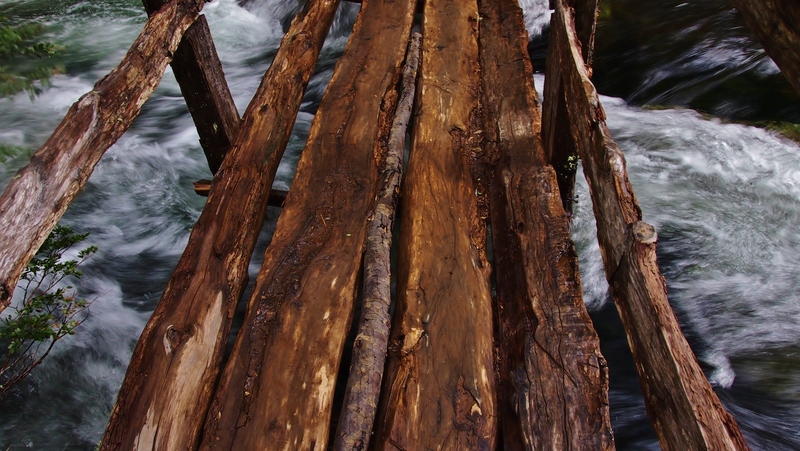 We struggled to cross bridges that had become submerged in water, like the one below. The Tres Lagos themselves were nicely set surrounded by monkey puzzles trees and dramatic mountains. 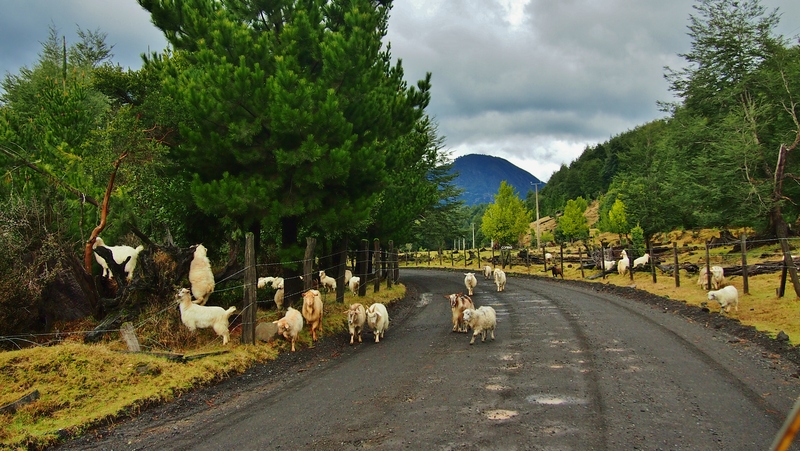 On the drive out the next day we came across a few goats on the road! 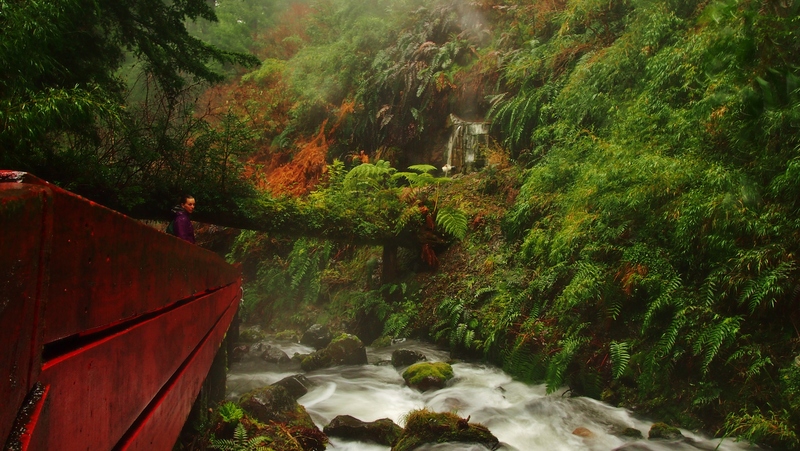 We camped on the access road to Termas Geometrica a truly inspired hot spring. It has been designed to engage the beauty of the vivid and luscious green canyon while taking influence from Japaneses Onsen. The result is 19 hot pools fed by numerous hot streams above a fast flowing river that cuts down the centre. 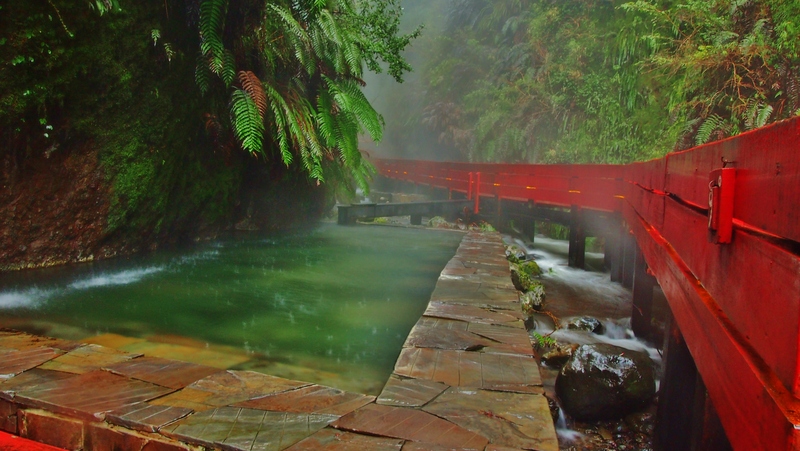 THe angular red board walks add a touch of Japan.The picture below shows the atmospheric rain falling and steam rising in the dramatic green canyon. This is one of the 19 hot pools that we enjoyed to ourselves. On a wet day like this we had nothing better to do so took full advantage of the empty pools. We spent the whole day hopping between different temperature pools, including the brutally cold waterfall. 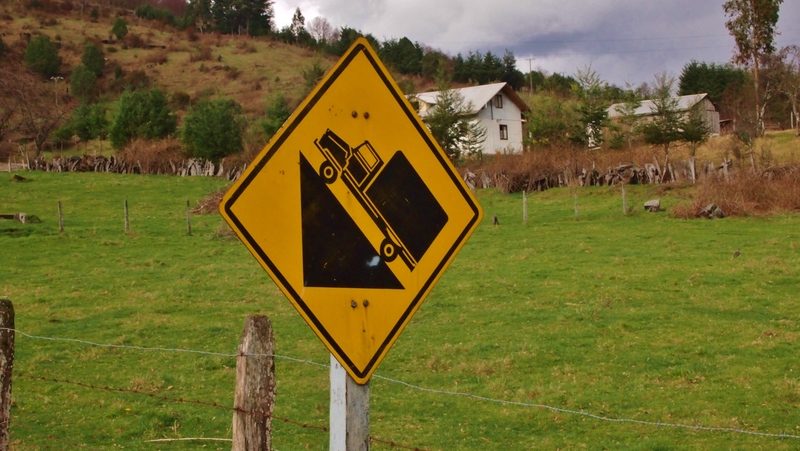 I particularly liked the Chilean road signs some made no sense, this one indicated the slope was steeper than a steep hill. We only saw these signs on sketchy gravel roads! 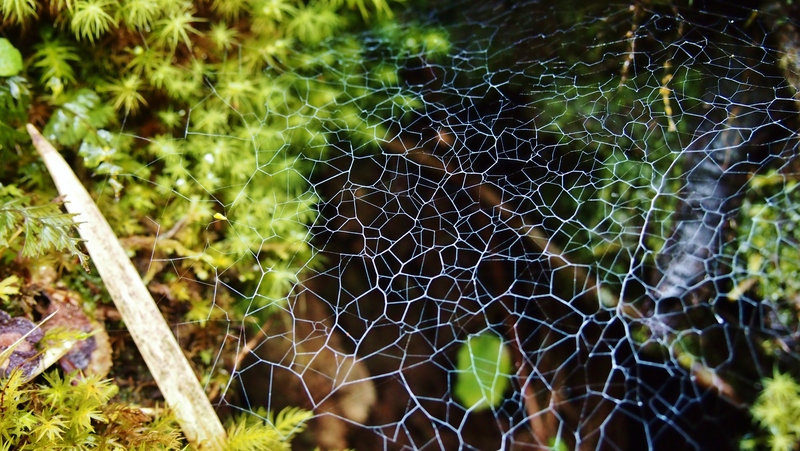 I am not sure if it is because they are in the southern hemisphere but the spiders seemed to go a bit crazy postmodernist in their web design! 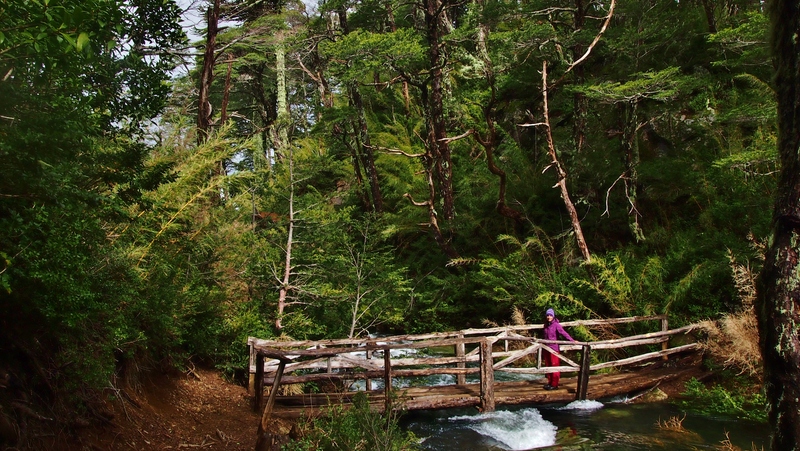 The was a great spot on the access road to Villarrica nationa park. We asked the ranger where to camp and he told us to speak to the house opposite so we did. The old chap appeared and showed as a spot including a picnic table where we could stay, he dusted down an old outhouse we could use as a toilet and then brought us some dry wood to start a fire. He also showed me the tinderbox properties of the Coihue tree leaves, even when soaking wet straight off the tree these leaves burn like dry paper. Ideal for starting a fire not so ideal at quickly burning national parks down…. His dogs kept us company all night by the van and next to the fire.